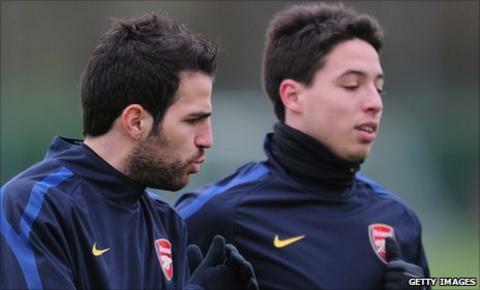 Arsenal have included Cesc Fabregas and Samir Nasri in their squad for the Champions League play-off with Udinese. Both players have been strongly rumoured with moves away from the Emirates Stadium in the summer. If either appears in the game they will be ineligible to play in the competition for any other club. New signings Gervinho and Alex Oxlade-Chamberlain were also named in the squad along with teenager Ryo Miyaichi for the game on Tuesday 16 August. Fabregas has been linked with a return to his native Spain with former club Barcelona while France midfielder Nasri has been linked with a switch to several Premier League clubs. But if they play in the first leg of the play-off against Italian side Udinese, it could affect the interest of any potential suitors. Miyaichi, 18, who was signed from Feyenoord in January and spent the rest of the season with the Dutch club, is in the squad after being granted a work permit. Ryo Miyaichi was granted a work permit on grounds of "exceptional talent"
Arsenal manager Arsene Wenger said: "We are absolutely delighted that Ryo has been granted a work permit. "This is almost like a new signing for us, as we weren't completely sure we would be given the authorisation. Miyaichi was granted a work permit on the grounds of "exceptional talent" despite a lack of international appearances for Japan. Wenger added: "Ryo has natural technical ability. "He has good balance and phenomenal pace, and his passing and crossing is consistently of a high quality. He is a very exciting player. "He had a successful time with Feyenoord in the Netherlands last season, who gave him the opportunity to play regularly, and we're looking forward to his contribution this coming season with Arsenal." Denmark forward Nicklas Bendtner, who has said he expects to leave Arsenal this summer, is also in the squad.